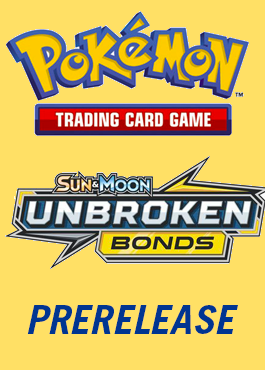 Pre-register for the Pokemon Sun & Moon Unbroken Bonds Prerelease on Saturday, April 20th starting at 10 am (Check-In starts at 9 am)! A Pokemon Prereleases is an event where new and veteran players alike receive access to the newest cards, build a deck out of them, and play for several rounds. Each participant receives a Prerelease box containing a 22-card Sun & Moon Team Up Prerelease Pack, four 10-card booster packs, and an exclusive foil promo card. The Sun & Moon Team Up Prerelease pack provides a solid foundation which, along with the booster packs and Energy provided by the Tournament Organizer, is used to construct a 40-card deck. Players will play for several rounds, with additional promo products being distributed at the end of the event. This format is great for beginners who have played the game before and looking to meet others in a friendly environment! Feel free to bring any playmats, dice, tokens, or other accessories you wish to use while you play. All cards are provided in the event.